An initiative to educate youth on the impacts of global plastic pollution. 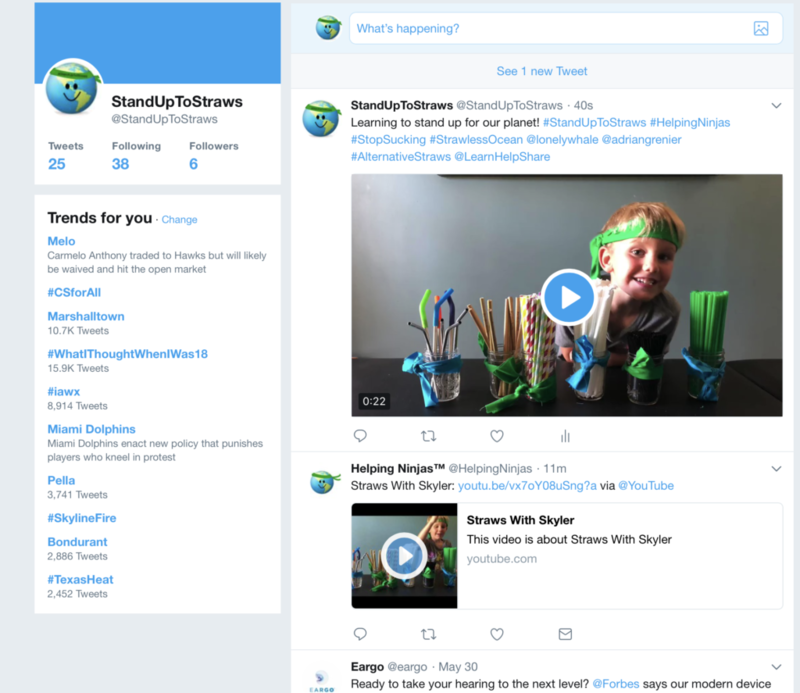 Helping Ninjas™ is leading a student-led campaign, #Stand Up To Straws, a youth initiative effort to create awareness, educate, inspire to make a change, and to stand up for what is right –reducing manufacturing and production of single-use plastics, such as straws. 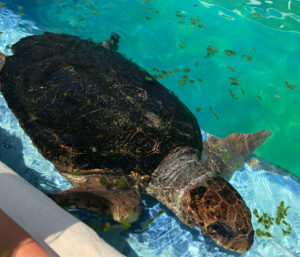 Plastic straws, amonst other plastic waste items, are causing tremendous environmental damage to the water quality, atmosphere, animals and marine life. Helping Ninjas™ #StandUpToPlastic initiative addressing global plastic pollution. As future leaders, we need to stand up for our planet and our marine life, and together take a stand to stop pollution of plastic. Helping Ninjas does not think that there is a mass prodcution world-wide need for plastic, and that much of it that is being proudced and used by consumers is wasted. Helping Ninjas hopes to help influence the reduce of plastic production. Consider the idea that if the manufacturing of plastic could come to a lower or minimum production, exploration of the intent to manufacture of only eco-friendly consumer items would become widespread. Did you know that only 9% off plastic EVER made has been recycled? Leaving 91% of the world’s plastic NOT getting recycled, and, its ending up in our oceans. In fact, scientists are predicting that by 2050 there will be more plastic in the ocean then fish. And, that is important because 70% of the Earth’s oxygen, comes from our oceans and marine plants. 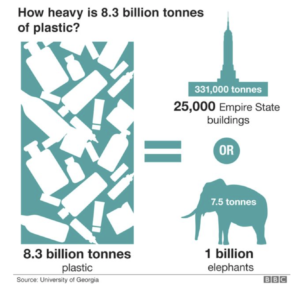 To prevent suffication, its time to re-think our single-use plastic items, find a way to ensure they are recycled, or reduce usage to elliminate waste. It’s time to stand up to straws and plastic, and Stand Up For Our Planet! While biodegradable items refer to any material that breaks down and decomposes, compostable goods are organic matter that breaks down to become a pile of nutrient-rich soil. Compost. Bamboo straws are commonly made in India. Helping Ninjas are asking community members to join in our efforts! To participate by simply just choosing to refuse a plastic straw and trying an alternative. Join in by learning, helpingand sharing and posting a picture of a StrawLess Cheers! Or by Flossing! Follow us on Twitter: @standuptostraws. Helping Ninjas encourages businesses to join in our efforts, too! We are inviting businesses to join our initiative by displaying our signs. To help engage and give community members a call to action, Helping Ninjas wants to invite patrons to join online in with posts announcing their pledge to #StandUpToStraws with pictures and videos of a “Straw-less Cheers”and our favorite, “The Floss”dance to celebrate – all in efforts to create awareness and begin positive change. It is our hopes that you would consider joining our efforts now, or to consider doing so in the future – helping others to learn about our efforts and encouraging community participation! We will showcase current measures your company is taking or what plans you intend to take in the future, and we will share your efforts on our website and social media! 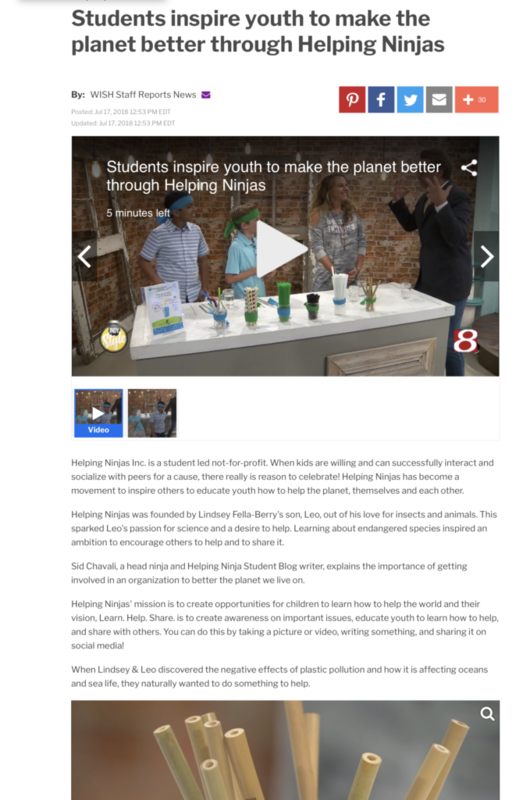 Helping Ninjas™ #StandUpToStraws was recently featured on WishTVIndy Style! Want to Join Our Efforts? You can also join our efforts and help our oceans by purchasing our sticker pack in the Apple™ App Store. In effort to help efforts to eliminate plastic straws and reduce plastic pollution, Helping Ninjas™ is donating 25% of its proceeds from the Helping Ninja Emoji Sticker Pack to organizations: @PlasticFreeJuly and @LonelyWhale. Learn more about our mission at StandUpToStraws.com. 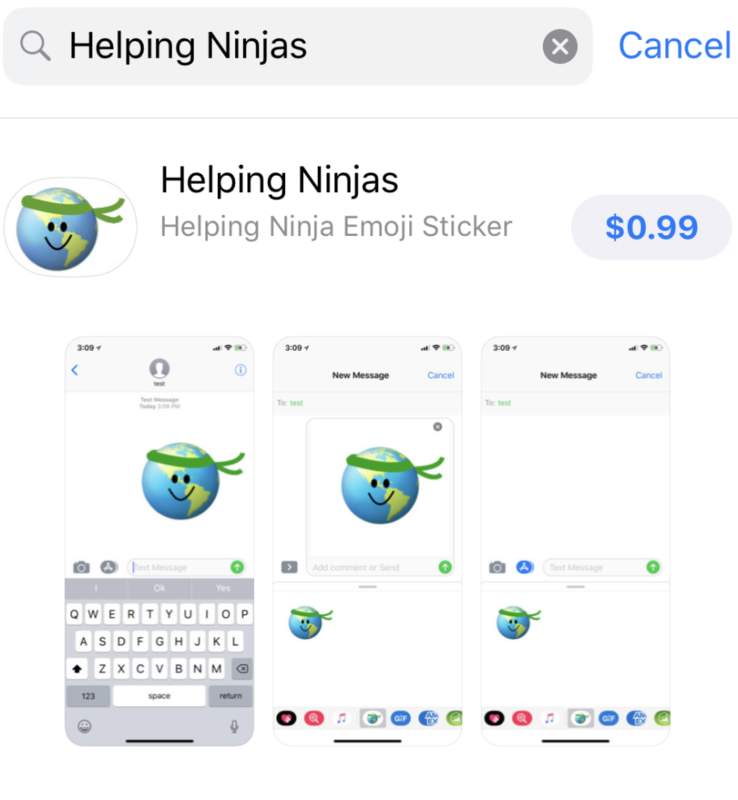 All proceeds from the Helping Ninjas Helping Ninja Emoji Sticker pack go to fund our projects and initiatives, like @StandUpForStraws. Each month Helping Ninjas will donate 25% of proceeds to other charitable causes. Open the Apple™ app store and search for Helping Ninjas. 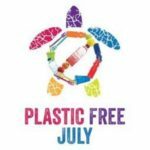 In effort to see first hand the plastic pollution and harm plastic straws are causing on our oceans, Twelve Helping Ninjas will be traveling to southern Florida during the month of June. During this time Helping Ninjas will explore and research the effects of plastic on our environment and will be documenting and recording all findings. These Helping Ninjas will also be visiting local marine animal rescue centers as well as researching local community efforts to make a difference. You are Never Too Young Too Learn To Stand Up For Your Planet! Click to see Alternative Straws with Skyler, 4 Year Old Helping Ninja! 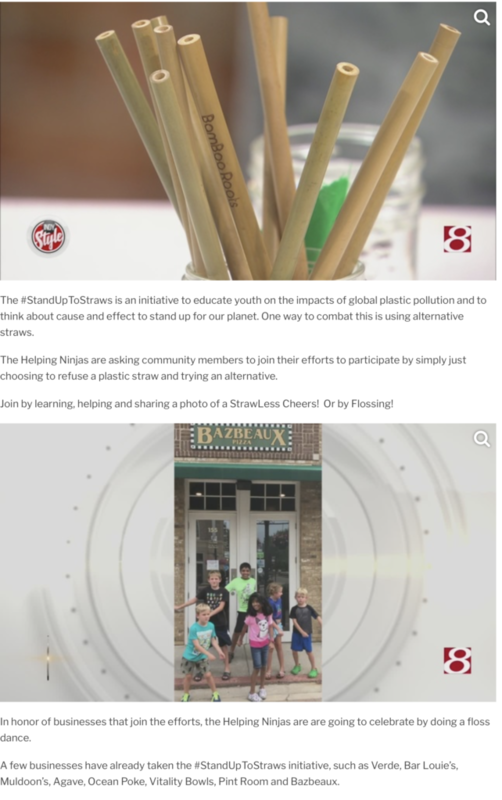 As a part of this initiative, Three Helping Ninja students are traveling to the country of India this year during the months of June and July and will be exploring and researching and making an effort to find source vendors to supply the eco-friendly straws such as bamboo and/or banana leaves – to local businesses, schools and organizations. We hope to help create a channel for distribution of eco-friendly straws and a cost-effective price to help create a sustainable program. Straws made of banana leaves and bamboo straws are commonly used in India, and sold at local markets in bushels of 200-300 for about 130 rupees ($2 U.S.). They are 100% biodegradable and 100% compostable. 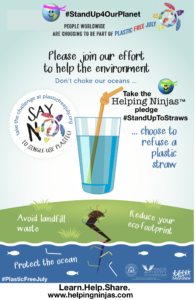 It is our hopes that Helping Ninjas can try to help completely eliminate plastic straws completely, however, to bring awareness that if straw usage is a must, to replace harmful plastic ones with biodegradable and compostable straws! Helping Ninjas raised over the last two weeks, $100 to purchase our first round of Bamboo straws while researching in India. We raised this money by recycling glass milk jars at Kroger and selling our old toys, shoes, a toddler firetruck bed, a kid bike to a local off hand store. 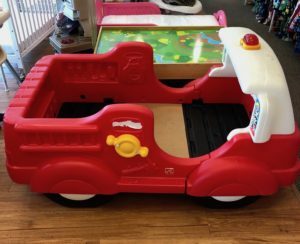 Founder Leo Berry’s little brothers Firetruck. It had been in the family for 5 years & now is being recycled for a good cause! With this $100 worth of alternative biodegradable straws, we will begin the portion of our campaign by giving samples to others. Trying to address any concerns of total straw elimination, showing that their is an eco-friendly and cost-effective alternative – plastic is NOT necessary. We will be giving samples to local schools, local athletic clubs, restaurants, churches, businesses, community organizations and corporation – everyone! And eventually, all schools, businesses, corporations and organizations across the world will know about this alternative and the importance of why we should use it. If straws are a must, then we must use safe straws! Helping Ninjas™ was first founded because of a love for animals. Founder, Leo Berry, has always had a love for animals and insects and science. Naturally, Wild Kratts was a favorite past time show to engage. At the age of seven, a month before his 8th birthday, Leo and his mother sat down at the computer and began researching what animals were endangered. Leo’s mother knew that he loved animals and thought it might be an interesting topic to research, and gave them an activity to spend quality time together. 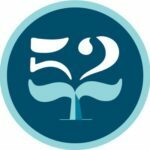 Write for our blog! Send us thoughts, opinions, facts, etc.. on plastic straw pollution. 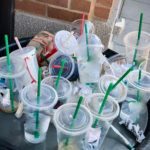 Why are plastic straws are bad for the environment? Why are plastic straws are bad for the ocean? How are plastic straws hurting marine life? Either that you have taken or that you find on Internet – please site photo origin, so credit is given where credit is due! Can YOU live without plastic straws? Why or why not? Restaurants, how they can stop using straws? Emails/Letters that you have written to anyone to not use plastic straw. Have an idea to add to our list above? Post on social media and tag #standuptostraws – Helping Ninjas will repost and then add it to our list! You can also e-mail any ideas or any of the above submissions. Helping Ninjas™ Incorporated is a student-led not-for-profit. Our mission is to create opportunities for children to learn how to help the world. #StandUpToStrawsis an initiative to educate youth on the impacts of global plastic pollution. It is part of our larger commitment to encourage youth to Stand Up For Our Planet. 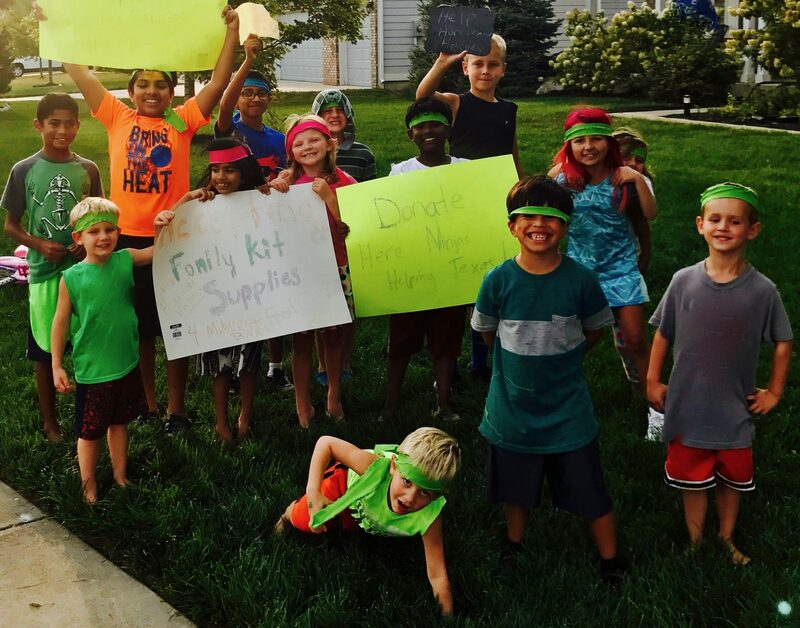 Helping Ninjas is excited to announce that College Wood Elementary in Carmel, IN is joining us in our #StandUpToStraws campaign. 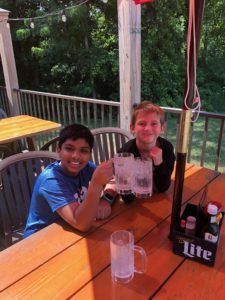 CWE is set to pilot this student-led campaign, eliminating plastic straw use in grades 3-5 beginning Fall 2018. Helping Ninjas are exploring alternatives for plastic straws for grades K-2. Watch Our #StandUpToStraws Campaign Video! 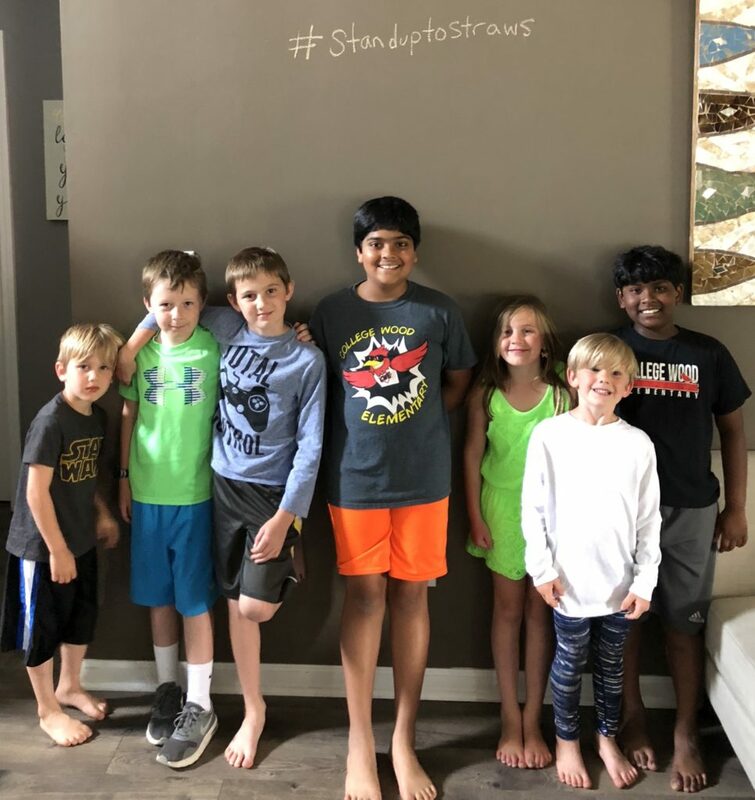 Helping Ninjas proudly announces that all thirteen Carmel Clay Schools in Carmel, Clay District is joining us in our #StandUpToStraws campaign. CCSGreenTeam and CCS Cafeterias are set to pilot this student-led campaign, eliminating plastic straw use in all grades beginning Fall 2018. Particpating shcools will only provide straws if required and/or requested. Let’s get inspired Learn.Help.Share. Learn about National Geographics #PlanetorPlastic and write thought, a message, an article, a blog post, or anything that inspires you! Like a picture or a drawing! Submit it to Helping Ninjas so others can learn too! Helping Ninjas will share it! 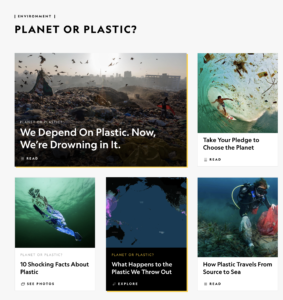 We want others to learn what you learn when reading National Geo™ Planet or Plastic recent awesome publication about plastic taking over our planet. It is a must read! Learn.Help.Share. Helping Ninjas, Inc. is a not-for-profit that is student-led and focuses on bringing awareness to the importance of teaching our youth ways to help the planet, each other and themselves. 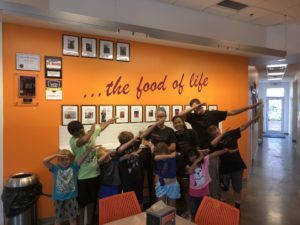 Helping Ninjas Inc. was founded by eight-year old Leo Berry, and was recently incorporated in February 2018. The organization currently has approximately 50 active youth and their family members engaged in its mission to become Highly Skilled At Helping. Helping Ninjas, Inc. has been awarded a U.S. Trademark for both their name and logo was published in the Official Gazette on May 8, 2018. Receiving the trademarks on the 8th was an awesomel yet ironic birthday gift for Leo who’s birthday is 9th of May!